WATCH What is China's Singles Day? It’s that time of year again: the biggest shopping day of the year. Add China as an interest to stay up to date on the latest China news, video, and analysis from ABC News. No, it’s not Black Friday. It’s China’s Singles Day, which falls on Nov. 11 every year. The online flash sale binge on China’s mammoth e-commerce giants, like Alibaba’s Tmall.com and its rival JD.com, begins at midnight Friday local time and lasts for 24 hours. For a few years now, Singles Day sales have far surpassed its U.S. counterparts of Black Friday and Cyber Monday -- combined. 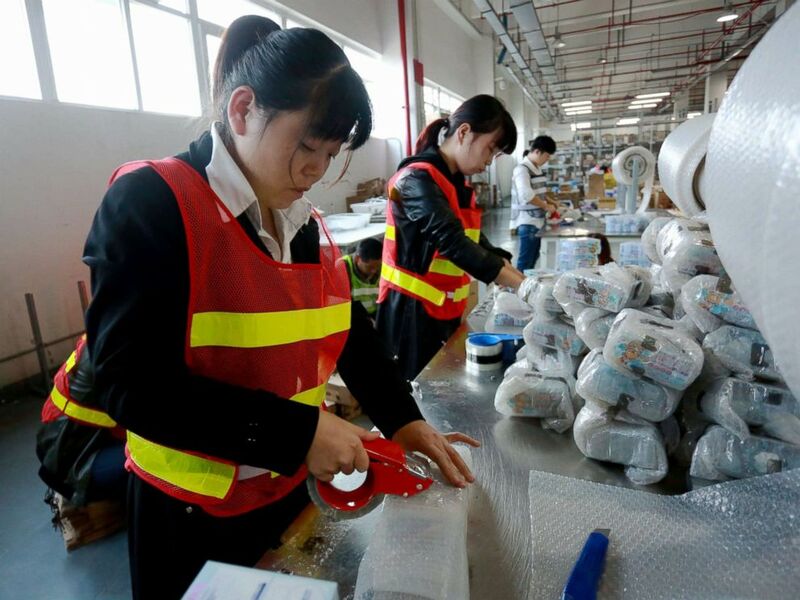 Staff members of a cross-border e-commerce company package products in Ningbo, China, Nov. 8, 2017. Last year, Americans spent a record $12.8 billion online between Thanksgiving Day and Cyber Monday, according to analytics firm Adobe Digital Imprints. Impressive until you compare it to the $17.6 billion in sales generated by Chinese consumers in a single 24-hour period during 2016’s Singles Day. This year, Citigroup told Bloomberg that Singles Day sales are expected to exceed $23 billion. That’s more than the gross domestic product of Iceland in 2016. Singles Day is China’s anti-Valentine’s Day -- known as “Bare Sticks Day” or “Bare Branches Day” in Chinese -- because the date "11/11" looks like bare branches and "one" is the loneliest number. Legend has it Singles Day began in the early 1990s in the dorm rooms of Nanjing University, one of China’s oldest and most prestigious universities, when a group of single friends bemoaned the lack of significant others and decided to mark the day by organizing activities as a group of singles and soothing their loneliness by buying themselves a gift. It was originally known as Bachelor’s Day, but soon became an unofficial day for all of China’s youth to celebrate -- or at least feel OK -- about being single. Then in 2009, sensing a lull between the sales period of China’s National Day on Oct. 1 and Chinese New Year in late January or early February, Alibaba’s Jack Ma saw an opening: retail therapy to soothe lonely hearts. The first year did only $7.5 million in sales, but just five years later, that record was broken in 12 hours. The countdown toward Singles Day has become a cultural event. Each year Alibaba holds a slickly produced live-streamed and televised countdown gala that has become more and more extravagant. The event held on the evening on Nov. 10 is basically a warm-up act until the flash sales go live at the stroke of midnight. This year’s gala is set to features appearances by the likes musicians Pharrell Williams and Jessie J, basketball star LeBron James and tennis player Maria Sharapova. Alibaba’s Ma, a tai chi aficionado, is set unveil a short film starring himself performing martial arts alongside Jet Li, "Rogue One: A Star Wars Story"’s Donnie Yen and Thailand’s Tony Jaa. Vendors are also getting creative to cut through the competition. The Chinese liquor brand Jiang Xiao Bai is offering an enticing deal for those who have an insatiable craving for the strong distilled Chinese spirit know as baijiu. As of this writing, Jiang Xiao Bai is offering 28 limited sets of a "lifetime supply" of baijiu for ¥11,111 ($1,672). The pictures of the bottles are wrapped with the words "This liquor is your partner for life." If you buy their Singles Day set, the company will send you 12 3.4-ounce bottles a month until you die of natural causes, or liver failure. It appears they have taken that into account. The purchase agreement the company is circulating online says that within five years of purchase you can transfer the supply to a family member in the event of the original purchaser’s death. The agreement also says that if the company folds anytime within 30 years of the purchase then the lifetime supply will be voided.